In 2014, the Children and Families Act was passed. It had three parts to it: Fostering and Adoption, Family Law and SEN and Disability. The SEN and Disability part is supported by the new SEND Code of Practice, which can be found here. This Code tells everybody involved in supporting children and young people with SEND, what the law says they have to do. It sets out clearly what local authorities and educational institutions should and must do. Should means they have to follow this guidance unless they have good reasons not to. The aims of the reforms were to ensure that children and young people with special educational needs and disabilities achieve well in their early years, at school and in college; find employment; lead happy and fulfilled lives and have choices and control over their support. The reforms will implement a new approach which seeks to join up help across education, health and care, from birth to 25. Help will be offered at the earliest possible point, which children and young people being fully involved in decisions about their support. This will help lead to better outcomes and more efficient ways of working. The vision is for children with SEN and Disabilities is the same as for all children and young people; that they achieve well and lead happy and fulfilled lives. The Children & Families Act places a duty on maintained schools and academies to make arrangements to support pupils with medical conditions. A healthcare plan will set out the type and level of support required to meet these needs. Guidance on “Supporting pupils at school with medical conditions” can be found by clicking here. What is an Education Health Care Plan (EHCP)and who is it for? This short video prepared by the Council for Disabled Children is a really helpful visual answer to this often asked question. From September 2014 Education, Health and Care Plans have been replacing Statements of Educational Needs and Learning Disability Assessments. They are person-centred plans that bring the child or young person’s education, health and care needs information together in a single document. EHC Plans are for children and young people between the ages of 0-25. EHC Plans are designed to give families more control over how they are supported and can include a personal budget. Having an EHC Plan means the different agencies that provide education, health and social care support will work together to help children and young people achieve their goals. Before children and young people get an EHC Plan they must have an EHC Needs Assessment. 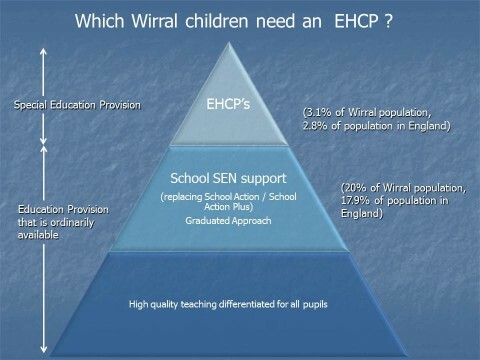 Click here to see Wirral’s EHC Plan format. Who is eligible and how to request an EHC Plan? To request an Educational Health Care Plan (EHC Plan) please contact the Special Educational Needs Coordinator in your child’s school/nursery or speak with your health visitor. Wirral is committed to giving all children and young people a high quality education that allows them to achieve well in their early years, at schools and college and lead happy and fulfilled lives. What is meant by Special Educational Needs? In Wirral the vast majority of children who have Special Educational Needs and or disabilities will have their needs met in their local mainstream early year’s settings, schools or colleges. The support required to meet most children’s SEN needs will come from the setting, school or college’s own SEN budget (This is known as Element 1 and 2 funding). Previously, this support was known as School Action or School Action Plus. It is now called the “graduated response”. Wirral have worked with its schools to produce “Wirral Threshold Documents”. These documents seperate Special Educational Needs and Disability into the four broad areas of the code and layout what is expected of schools in terms of their ability to support children and young people. The documents also include details of Pupil Funding Agreements, which is a local mechanism by which the Local Authority can help schools support a broader range of children with SEND. This is to ensure that their educational outcomes can continue to be met in Mainstream schools (without the need for an EHCP). Pupils with PFA’s will remain in their Mainstream school. PFA funding is for those who require additional support over and above the resources made available within the schools SEN notional budget. Schools may be allocated up to an additional 7 units of support. Applications for PFA are to be made by the school to the Local Authority using the Threshold documents. Admissions to special schools are managed by the SEN team at Hamilton Building and are restricted to children who have an EHC Plan. This team can be contacted via the Children and Young People’s Department, SEN Section, Hamilton Building, Conway Street, Birkenhead, Wirral, CH41 4FD. Tel: 0151 666 4224. Or by clicking here. The revised SEN Handbook which incorporates the SEN Toolkit and the new Wirral Threshold documents is listed below. The SEN paperwork/referral forms have also been subject to review and will be added very soon. Also new is the Council for the Disabled’s booklet which clearly sets out good examples of EHCP completion. Other advice requested by parents or young person towards the Assessment of a child’s Education, Health and Care needs. This paperwork is currently under review and will be listed shortly. When disagreements arise between young people or their parents/carers and the local authority or education, health or social care providers about an aspect of a child or young person’s special educational needs or provision they can be difficult to resolve. Although ‘disagreement resolution’ and ‘mediation’ are often used interchangeably, under the Children and Families Act they have different meanings. Disagreement Resolution is for young people with special educational needs or disabilities (SEND) and parents of children with SEND whether or not they have an Education Health or Care plan (EHCP). It allows parties to come together to discuss issues and explore possible solutions in a respectful, constructive way. Disagreement resolution meetings are often successful in finding a solution which is agreeable to both parties and can prevent the disagreement from escalating. Both parties come to the meeting voluntarily, with a view to resolving the disagreement amicably. During the meeting a neutral facilitator ensures that both parties have the opportunity to explain their points and listen to what the other party has to say. Young people or their families who have, or who have requested an assessment for, an Education Health and Care plan (EHCP) or statement have the right to ask for mediation if they are unhappy with anything concerning the EHCP or statement. Mediation is a confidential process (except in cases where there are safeguarding issues) and is conducted in a safe, neutral environment that allows for both parties to be listened to and understood. Young people and families will be asked to consider mediation before registering an appeal, but having done so, they also have the right to decline it if they so wish. This decision will not affect the outcome of the appeal. If the disagreement only concerns the name of the educational establishment then the case can proceed straight to appeal without the need for mediation. There are separate appeal processes for challenging the health and social care parts of the plan. How do I get more information about mediation? This useful document offers advice and outlines the options and process for pursuing resolution including via Tribunals. What is the difference between IAS Services and Independent Supporters? IAS Services are statutory services who are expected to provide information, advice and support to disabled children and young people, and those with SEN, and their parents/carers. They are expected to provide IAS on subjects including local policy and practice, the Local Offer, personalisation, personal budgets, the law on SEN and disability, health and social care. For more information see About IAS Services, the IASS Network Quality Standards https://councilfordisabledchildren.org.uk/information-advice-and-support-services-network/resources/ias-services-quality-standards and Chapter 2 of the SEND Code of Practice. Your local IAS service is Wirral SEND Partnership and they can be contacted on 0151 522 7990 (option 2). The Independent Support Programme is a programme that provides additional support to young people and parents during the implementation of the SEND reforms, and is funded by the Department for Education (DfE). The IS Programme provides independent supporters in each local area, as an additional resource and for a time limited period, to work directly with young people and the parents of children being assessed for an EHC plan. For more info see the IS Programme pages on the CDC website https://councilfordisabledchildren.org.uk/independent-support. Your local IS service is PSS and can be contacted on 0151 702 5555. 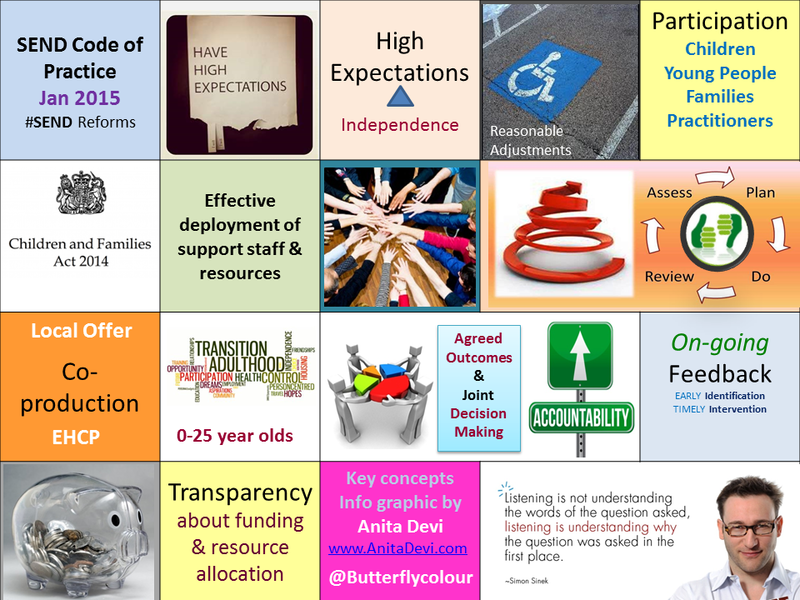 Useful resources to support you navigate the SEN process. Useful read on the Annual Review process is being updated and will be available for the start of the Academic Year 2018/9. Should the need arise to make a complaint IPSEA have prepared guidance to advise how to lodge a complaint against a School or the Local Authority.